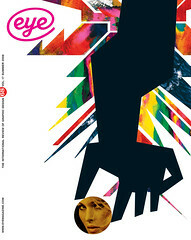 Katy Keene made comic history by being the first magazine to be designed in part by its readers. Some of the most interesting intersections between social media networking and popular culture fly below critical radar – comic books and fan publications whose youth-oriented storylines have, in some cases, been generated by their fans. While fan networks are not necessarily new (the first US movie fan magazine was founded in 1911), how many comic book characters can claim to be the focus of a loyal fan club and pen pals, with merchandising to match, and whose clothes, houses and cars are created by the fans themselves? Katy Keene (1945-61) was a unique and delightful comic book that deserves recognition not least because of the way in which it engaged reader participation and broke down the barrier between comic artist and fan. 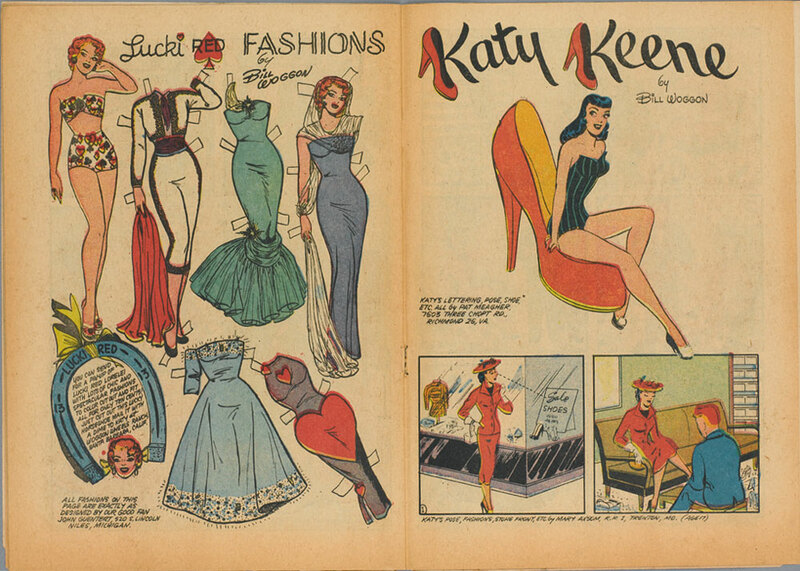 Created by American illustrator Bill Woggon (1911-2003), Katy Keene made her debut in issue no. 5 of Wilbur (Archie Comics) in 1945, and gained her own title four years later. The character also appeared as a paper doll both in the comic book and in a separate publication series. 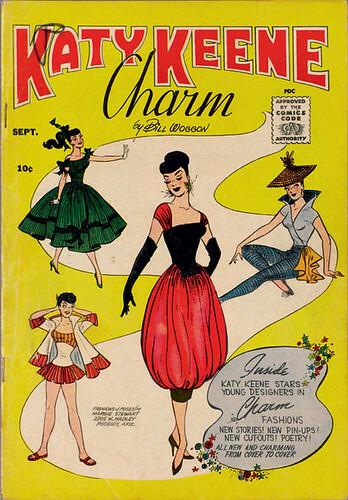 Above: cover of the Charm issue of Katy Keene, 1958. The cover features one young fan’s interpretation of the latest glamourous styles for Katy, the up-and-coming catwalk model. Top: spread from Katy Keene Fashion Book, 1957. Katy’s best friend Lucki Red, as a paper doll, gets the wardrobe treatment, and Katy’s obsession with shoes is reflected in the lettering. Katy Keene is part of the history of newspaper comic strip. Predecessors include Winnie Winkle (1920-96), Brenda Starr (1940-) and Miss Fury (1941-51), whose main characters were depicted as independent career women, and who were also significant in their capacity as contemporary fashion plates. As a character, Katy Keene was drawn to reflect the fashionable female image of America’s 1950s postwar period: less exotic ‘pin-up’, more girl next door – but with the ambition and drive to make it as a successful career woman. What makes Katy Keene significant is the process by which the designs for her clothes, possessions and other elements of the graphic page, such as the lettering of the story titles, were submitted by fans. While Woggon was not the first to use fans’ drawings in a comic book, he was unique in actively sending out a call to readers. He would redraw the designs to fit the comic book characters, attributing each contribution with the fan’s postal address. As a result, Woggon established a loyal fan base, many of whom went on to become established designers in their own right (names include Anna Sui, Betsey Johnson, Lloyd Sensat, Jack Evans, Barbara Rausch and John Lucas). Above: spread from Katy Keene Pin-up Parade, 1959. Katy is crowned ‘Queen of Outer-Space’, reflecting 1950s America’s optimistic vision for the future. A special issue of Katy Keene called Charm was published in 1958 in order to feature photographs and the biographies of young Katy Keene designers and their submissions. This form of personal interaction between audience and creator allowed fans to feel part of the creation of Katy’s life (however much a fantasy it might have been). 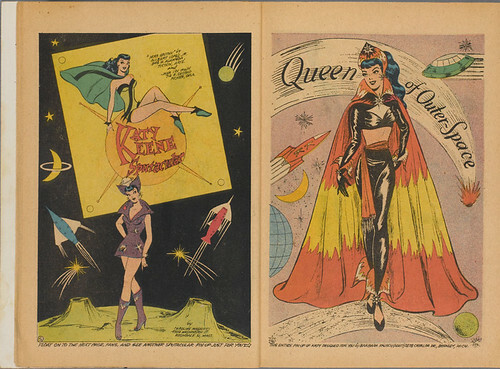 A fan magazine, Katy Keene Magazine (produced by Craig Leavitt) also played a key role in the 1980s resurgence of interest in the comic book. There are other reasons why the Katy Keene comic book should not be forgotten. Woggon’s artwork and the use of colour printing was intensely sensual, making the most of deep reds, greens and blues, an approach reflected in films of this period, in particular the Hollywood melodramas of Douglas Sirk. But to her fans, Katy Keene will always be the ‘pin-up Queen’.